Table top trees have become a very popular holiday decoration. Whether it be the convenience or the aesthetic, who can say? All we can say is that Sturgill’s Tree Farm can provide you with some of the most beautiful foliage decorations Western North Carolina has to offer. Real table top trees are the perfect decoration for anywhere. 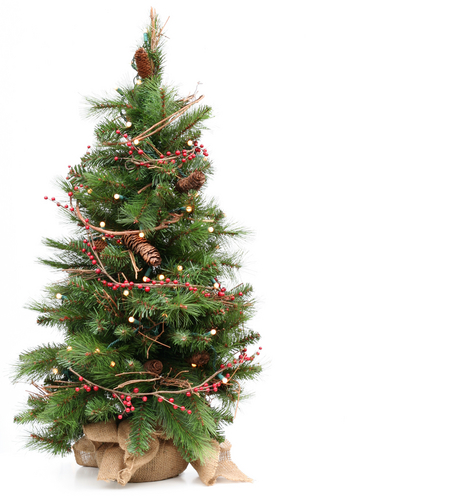 If you’d like to bring some seasonal spirit to your office, but there’s not enough space for a tree, why not purchase one of our table top trees? Maybe you have a full size Christmas tree, however, you love the fragrant smell of firs. If this is the case, come to Sturgill’s Tree Farm and pick up some real table top trees! Each one of our real table top trees comes with its own stand, making it a great gift for any friend, family member, or neighbor. Miniature may not be your style. Then skip the table top trees and get yourself one of our gorgeous full-sized Christmas trees. We have a vast selection of Fraser Firs, Norway, Blue Spruce, Canadian Hemlocks, White & Scotch Pines. Sturgill’s Tree Farm is happily located in the heart of the Blue Ridge Mountains. If you don’t call this place home, but you still want any of our gorgeous foliage decor, we do ship nationally! Or, if you are lucky enough to call Western North Carolina your home, arrange a time to come pick up your garland, table top trees, or Christmas tree! For over 30 years we have been producing some of the finest Christmas trees, and we will happily continue to do so! Sturgill’s Tree Farm is a proud member of the following associations: Ashe County Christmas Tree Assocation, NC Christmas Tree Association, North Carolina Nursery and Landscape Association, National Christmas Tree Association and Virginia Christmas Tree Growers Association. Ashe County is actually the largest Christmas Tree producing county in the United States as of 2015! Just because real table top trees are cute, convenient and less work to maintain than real Christmas trees, doesn’t mean they don’t need any care. As a rule of thumb, a tree can use up to a quart of water per day for each inch of stem diameter. This can also vary, depending on the climate that the tree is placed in. If the area has a low relative humidity, the tree may require more water. In order to prevent your tree from drying out faster, it is recommended that they’re kept in shade and out of weather extremes and wind. Safety is typically the most important thing to remember. Please check all lights and electrical decorations before placing on your tree. Never decorate a tree with lit candles! Also, when leaving the house, make sure all electrical decorations are turned off and that the tree has plenty of water! We want you to get the most out of your table top trees! Like most things, it needs love, so be sure to learn how to care for it! Come visit Sturgill’s Tree Farm for this year’s seasonal needs!